I was making my Mexican Style Slow Cooker Chicken and couldn’t decide on a side dish until I remembered this fantastic corn I used to have all of the time at the Del Mar Fair in San Diego. You can get some wacky food at the fair, but I past up the deep fried Twinkies and cheesecake to head straight for this grilled corn. It is sweet and salty all at once. It is the perfect balance! But as much as I loved it, this again was another recipe I had never tried at home. I really hate it when I underestimate myself. Sometimes I make things seem so much more difficult that they are in my head. Once I sat down and really thought about the flavors in the corn the wheels started turning in my head (no smoke came out I promise). I knew there a fantastic combo of flavor. After trying it a few times and not coming up with exactly what I was looking for I tried this and BAM there it was, the wonderful flavors I was looking for. I had flash backs of all of my years at the fair and it was wonderful. The family may not have had the flood of memories but I can promise you there will be memories from now on!! Remove the husks of the corn but leave the core attached at the end so you have something to hold onto. 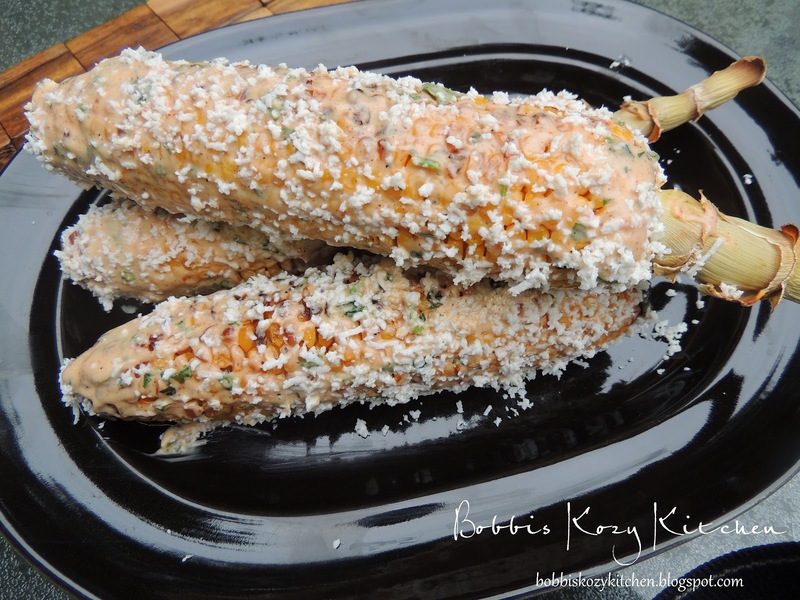 Grill the corn on a hot grill or cast iron griddle pan until slightly charred. Turn it so it gets cooked evenly all over. Mix the yogurt, sour cream and cilantro together. Grate the cotija cheese in another bowl. While the corn is still warm slather with yogurt mix. 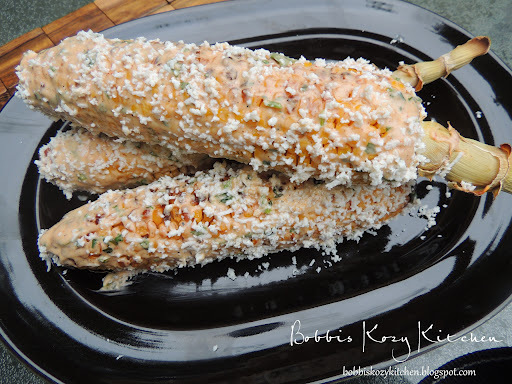 Squeeze lime juice over the corn, Season with chili powder and generously coat with the cheese.